Situated just 20 meters from the sea, with a view on the sea , surrounding islands and a garden full of greenery. The house have 3 apartments for 8 people . 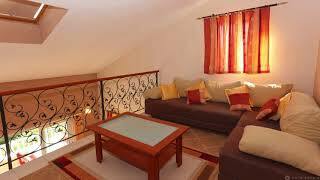 Apartments have a 4 star and can be called true luxury villa . The apartments have fully equipped kitchen, wi-fi, sat-tv, air conditioning, parking, access to the garden with barbecue, private beach with parasols and deck chairs, mooring for boat, space with washing machine. Sevid, just hidden from the city bustle , and close enough to see everything . Sunny and hidden corner of untouched nature is ideal for a true Mediterranean holiday . Although small , Sevid has everything you need , shop , restaurants , bar , clear water and beautiful beaches . Ideal for families with children during the hot summer days , as well as in winter . In Sevid you can rent a boat, pedalina, kayak, jet ski, enjoy all water sports, ride a bicycle, go fishing, and dive.. Situated 40 km from Split and Šibenik , 20 km from Trogir and Primošten in Central Dalmatia .